No nuts, no problem! 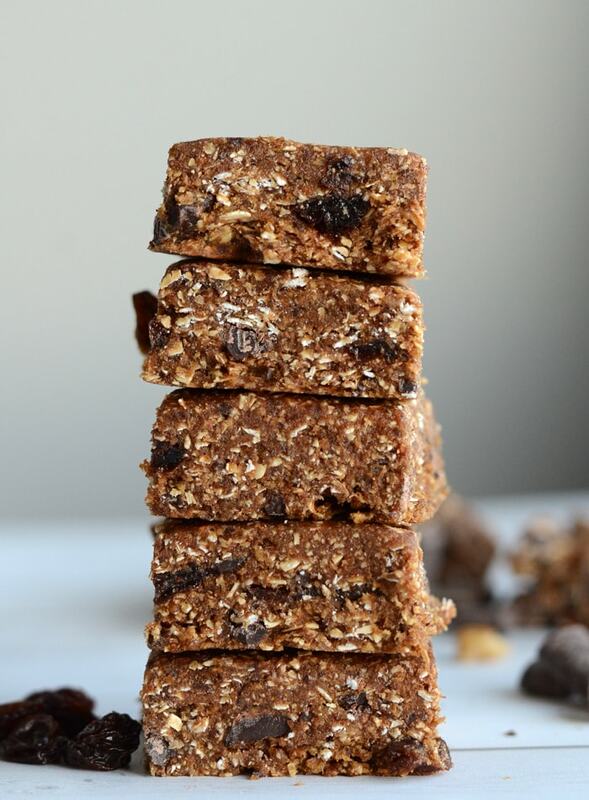 These healthy no-bake oatmeal raisin bars with chocolate chips are nut-free, gluten-free and oil-free and made with just 4 simple, wholesome, everyday ingredients. 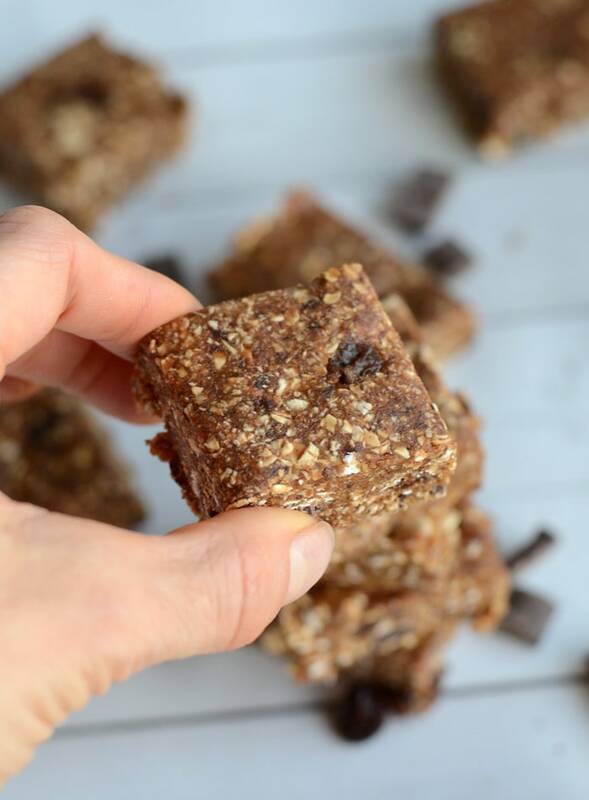 Quickly prepped in your food processor then pressed and cut into 16 healthy energy bars, this easy recipe is sure to become one of your favourites! 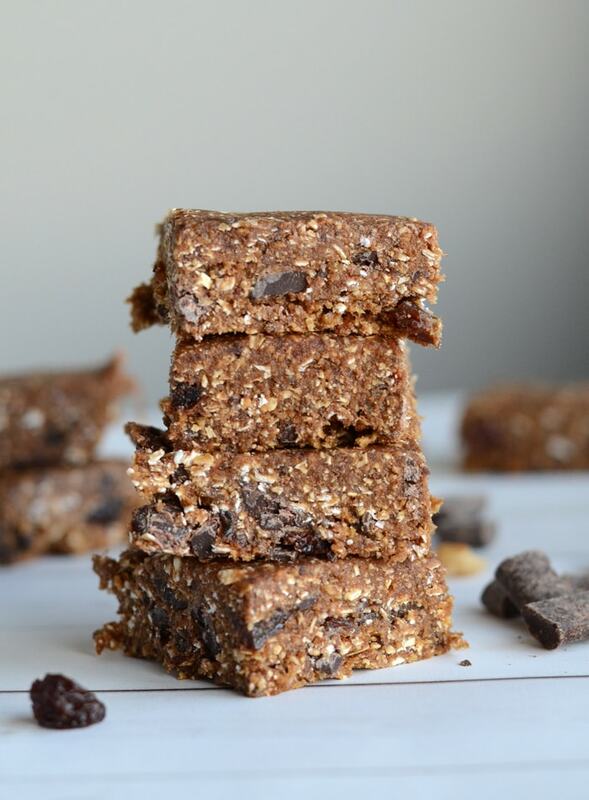 I added dairy-free chocolate chunks and raisins to these no-bake oatmeal raisin bars. I love the flavour of the bars with both added in. To switch it up, feel free to just add chocolate or just add raisins. If you want to make them fat-free, go with raisins only! Technically you could leave both out but that’t not really much fun, is it? I used Enjoy Life Mega Chunks to make mine. Enjoy Life Chocolate Chips or Lily’s Baking Chips would also be good. You can also use a chopped dark chocolate bar. I like Green & Blacks Organic Dark Chocolate. I love these bars straight from the freezer. Because of the high natural sugar content in the dates, they don’t freeze solid so they’re a bit hard but still chewy. They’re also delicous stored in the fridge, a little bit softer but still nice and firm. You can also store them at room temperature but I’d recommend at least keeping them in the fridge. If you don’t like them cold just let sit at few minutes at room temperature before eating. They’ll also keep longer if kept cold. I can’t tell you how long though, ours obviously didn’t last long enough to find out. These make an excellent alternative to store-bought energy bars. To make a larger meal replacement bar, you can cut them into 8 large energy bars and wrap individually in saran wrap or wax paper. That way they’re quick and easy to grab-and-go whenever you need to take one on the road. Toss one in your gym bag for a pre or post-workout snack, keep one in your purse if you’re out running errands, grab one for breakfast or pack them up for a big hike! 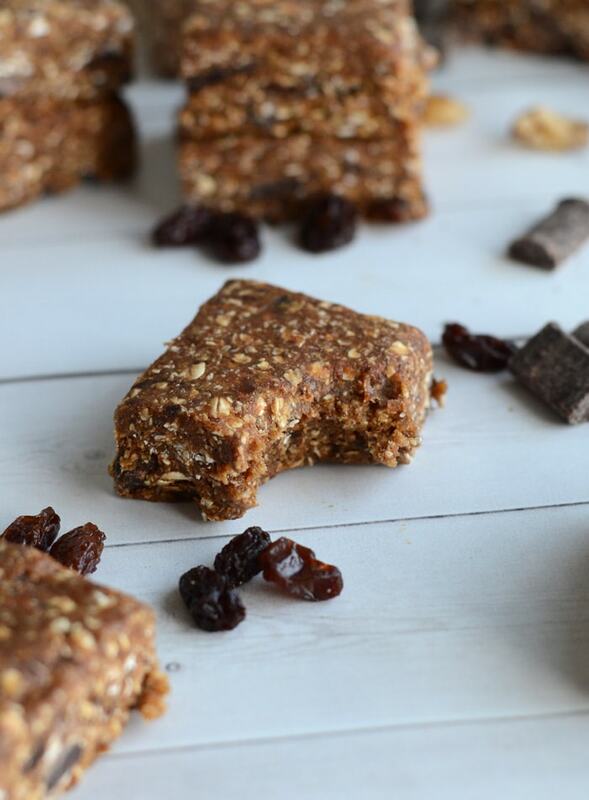 The clean, energizing carbohydrates from the dates, oats and raisins make these bars the perfect solution for an active day. 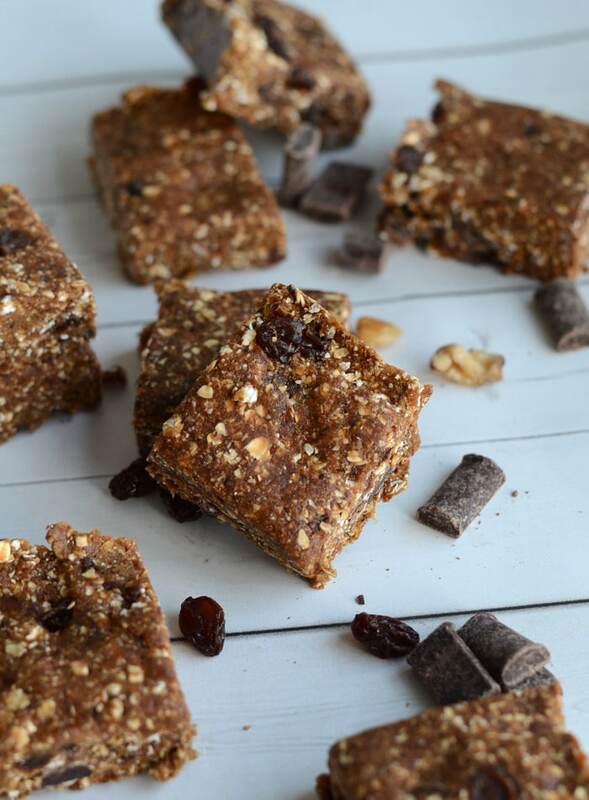 Whether it’s training, hiking or shopping, these are so healthy and delicious, no need for store-bought bars! 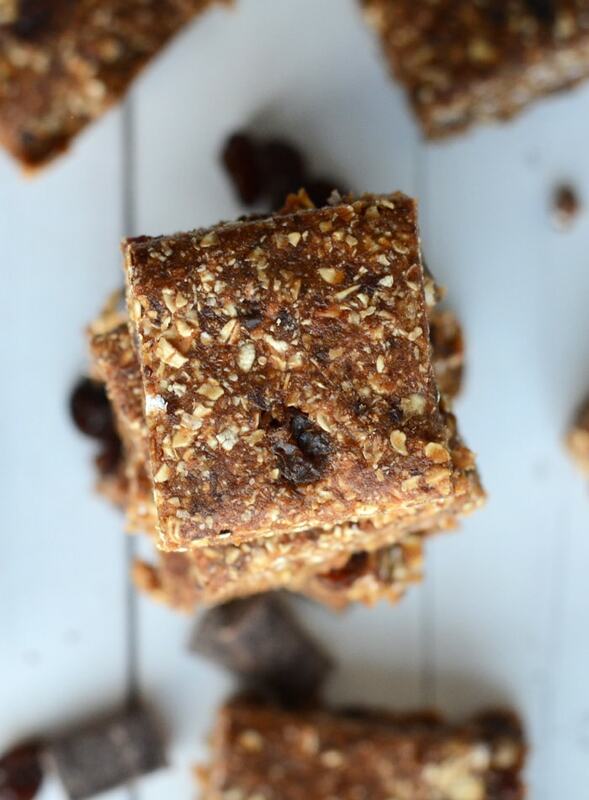 There’s not much to these no-bake oat bars, one of the reasons why they’re so great! Chances are you already have everything you need. All you need to do is blend 4 simple ingredients, press into a pan and then cut into bars! If you need these no-bake oat bars stat and only have oats and dates on hand, go ahead and make basic nut-free oat bars with just those two ingredients. You can also customize them by tossing whatever you feel like: cranberries, chia seeds, chopped dried apricots, cashews. Anything goes! I didn’t add cinnamon to mine but that would be a yummy addition too! These are my new favourite snack! They’re sweet but not too sweet with a hint of sea salt and the big chocolate chunks mixed with chewy raisins make the best combination. Place the dates, oats and salt in a high-powered blender or food processor and mix until it forms a thick dough. Add the chocolate and raisins and pulse to combine. Line a square baking pan with saran wrap or parchment paper and firmly press the dough into the pan. Place in the freezer for an hour or the fridge for a few hours. Lift out of the pan and cut into 16 squares or 8 large bars. These look great. I have some flapjacks that I keep in the freezer- for some reason they just taste better cold to me! That looks really good and its healthy for you! Sounds yum and looks great! I think these will keep the munchies at bay and I’m definitely gonna have some of these in my bag when I go to work next. Thanks for sharing! Yummy and I like the fact that it is healthy. This is so delicious and healthy. Thanks for sharing. You are most welcome, glad you enjoyed! I made these no bake oatmeal raisin bars without using the chocolate. They are very good but a little too sweet. Do anyone know how many calories are in one bar?